During a late summer thunderstorm, which is very common in Central Florida, two tiny kittens were found crying in the rain; their eyes sealed shut with infection. Neither cat could see which way to go due to their temporary blindness. They just laid there in fear getting drenched in the downpour. Thankfully a good Samaritan happened to see them huddled up near a trash can. She immediately picked them up and bundled them in her shirt to warm them and took them into her house. The kittens were dried off and placed on a heating pad. Upon examination of their eyes, they both had severe infections and the oozing had caused their eyes to be sealed shut. The rescuer went to work cleaning their eyes with a warm, wet cloth until they could both see again, but they were still in danger. Both were about 2 weeks old and not completely weaned. Every four hours they were bottle fed, and every hour their eyes were cleaned. The rescuer began to search for a cat rescue. Candy’s Cats Inc. located in Ocoee, Florida immediately offered to help. Candy Sullivan, founder of the cat rescue, called her vet and got an appointment set up for the kittens to be seen. She also called on a foster who was skilled in caring for such young kittens. After treatments for their eyes, and in the excellent hands of their foster mom Myrna, both kittens, now named Minky and Pepper are thriving. Candy’s Cats Inc, is known in the Central Florida area as the rescue who will take in hard luck cases, cats and kittens who are maimed, ill or about to be euthanized. Candy’s Cats is currently teaming up with the Pixel Fund, another animal advocacy group for a big adoption event. The “Fall in Love” adoption event will be held at Headquarter Honda located at 17700 State Road 50, Clermont, Florida on Saturday September 23rd, 2017from 11am to 4pm. Visit http://www.candyscats.com/. 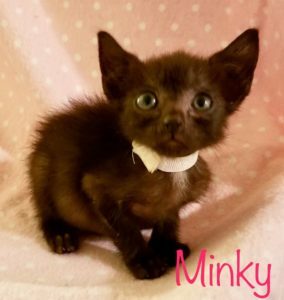 to learn more about this amazing rescue, see their adoptable cats and kittens and donate to help kittens like Minky and Pepper. 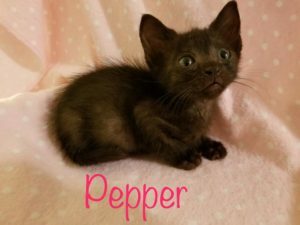 Pepper after her eyes have healed. They are both such Cuties!!! Thank you you kind folks. Thanks to the person who took these kittens and cleaned them up and got them to a rescue. Hope the rescue can get them adopted. What sick thing did this to these cute kittens. Such precious little bundles of joy. I hope their future is as bright as their eyes are now! Giant THANK YOU to the kind person who rescued Minky & Pepper AND to Candy’s Cats for taking them in and turning them into the bright eyed adorable little kittens they now are – All they need now is a loving forever home.